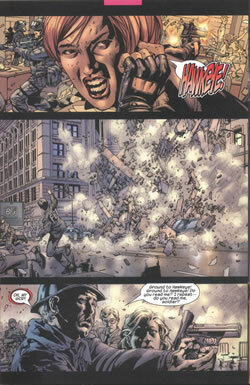 As the 1960s drew to a close, the average age of comics readers was rising, due mostly to Marvel's efforts in creating stories that dealt with more grown-up subject matter. 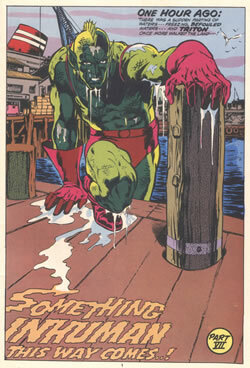 Artists like Neal Adams were coming to the fore. These younger artists seemed quite happy to spend extra hours scratching away at creating more detailed and intricate artwork for the sheer love of it, as they received the same page rate as their more experienced seniors. In a charge led by Adams and Jim Steranko, comic art was forced to become more complex as the work of pencillers like Howie Chaykin, Gray Morrow and Bernie Wrightson gained in popularity and acclaim. Neal Adams spends most of his effort on the foreground figure but leaves no doubt in the reader's mind just where it is that Triton of the Inhumans is coming ashore. 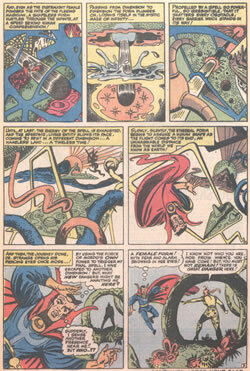 I couldn't let an article about backgrounds go by without mentioning the cheerfully insane environments Steve Ditko created for Doctor Strange during his phenomenal run on Marvel's Strange Tales.